Is the Kanze Noh Theatre for sale? According to the business magazine Gendai Bijinesu (Kodansha) the Kanze Nōgakudō in Shōtō, Shibuya, one of Tokyo’s most exclusive residential areas, may be soon put up for sale. In the article reporting the news, the land on which the theatre is now built, measuring 840 tsubo (approx. 2,777 square meters) is stated to be worth over 30 billion yen (approx. 30 million US dollars). Fujisawa Shōwa, owner of Yodobashi Camera, who lives in the neighbourhood, has been identified as a potential buyer. 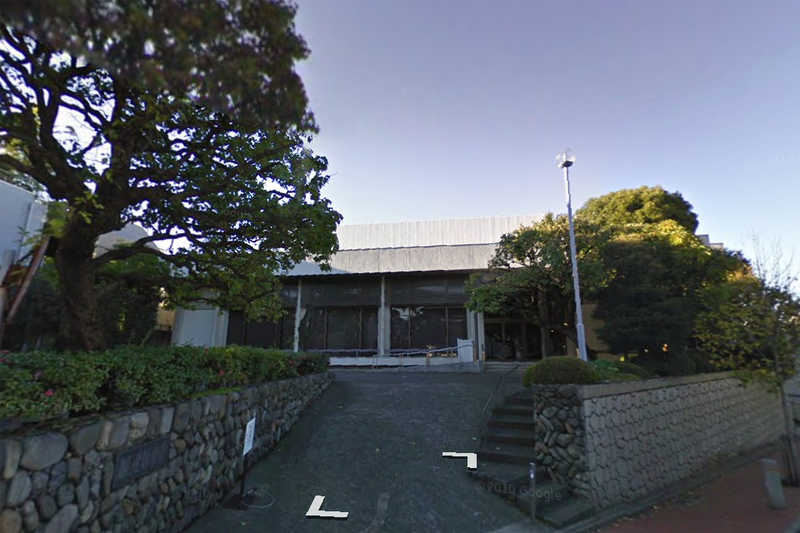 According to an unspecified major real estate company, the Kanze-kai (that is, the company that owns and manages most of the Kanze school property) is considering selling the theatre. Of course – I would add – selling does not mean shutting down the business, but simply relocate elsewhere while cashing what is an extremely valuable piece of land in the heart of Tokyo. How to interpret the potential sale of the Kanze Nōgakudō? Could it be justified with a need to renovate the venue? Or is it yet another sign of the crisis that is tightening its grip on the Noh establishment? The post-Lehman financial shock is only an additional factor to a more specific, economic but also cultural (can we separate the two?) crisis that Noh is undergoing since the early 1990s. The Noh audience is ageing, therefore naturally reducing, a trend that might lead to its biological extinction within some 20 years, unless critical measures are taken. According to the Gendai Bijinesu article, the Kanze-kai has shown a loss amounting to 10 million yen between the 2009-2011 fiscal years. However, the manager of the Kanze Nōgakudō has explained that, after the 2011 Tōhoku earthquake, the construction of a safer building has been discussed, and that money is not really the issue. What we should be more concerned with is the ageing of the Noh audience, and the consequent need to make efforts to attract a new generation of young spectators. This is certainly true, and it would impact on the economic condition of Noh the large majority of Noh actors, who are in need of financial support in order to continue to perform their art. Of the three great performance traditions of Japan, Noh is the only one which, after having lost its aristocratic patrons with the advent of the Meiji restoration, is struggling to survive while maintaining its economic independence, counting primarily on amateur practitioners who learn directly from professional performers (and pay directly to them). Kabuki is managed (owned?) by Shōchiku, a huge movie and theatre production company, and is supported by corporate sponsorship. Bunraku has lost the battle, and is now surviving thanks to public subsidy. Noh still lingers in a limbo between feudalism and capitalism. Meanwhile actors who can’t make ends meet sell their costumes, masks and books, while Wanya-shoten and Hinoki-shoten, publishers of Noh books, close shops in Tokyo and Kyoto. Does Noh need a new economic model in order to get out of this darkness? Posted on 30/10/2013 Categories GeneralTags aged, crisis, economic, Kanze, Nogakudo, Shibuya, theatre, Tokyo8 Comments on Is the Kanze Noh Theatre for sale? Today I went to the Kanze Nogakudo to see the last Urata Teiki Noh. Today’s programme featured the rare Morihisa, and Hagoromo. There is a lot to say about the two performances I saw, but in this post I will talk about another aspect of today’s experience. Something that I am afraid contributed to an at least partially negative reception of the performance. I’m not going to write an essay here, I will just copy here some thoughts that I jotted down during the play. Today's average age of the audience: 70 years. There's all kinds of good reasons for this. Will write about them next time. Bad smell in the theatre. Most of it comes from cheap/old fashioned hair spray. Huge queue at the toilet during the break. Amateurs who bring their utaibon and take the Nogakudo for a Noh sing-along karaoke kind of place. Grannies sucking on candies, usually taking ages to unwrap them from a very noisy plastic wrapping. Bad hearing makes people shout instead of whisper. No wonder young people don't want to go to the Noh theatre. If I took a friend today I'm sure he/she would have never wanted to come back to what seems to be a retirement house... AGE IS AN ISSUE! This post is ironic but the matter is serious. Will expand it in a more academic fashion some other time.